Kelsey and Jarred had such a fun engagement session. We brought them to the Village of Lewiston. They wanted a small time feel for photos. This area was perfect. We walked around Center Street and stopped everywhere for photos. We used store fronts and restaurants as back grounds. As we were walking by Coppins Auto Shop, Neal happened to see this old car in the garage. He paused and said he was going to ask if we could bring the couple in for a quick photo near the car. The guys at the garage were super nice and said no problem. The garage was so cool inside. We found a place for Kelsey and Jarred to stand. Neal only wanted to have the focus be on the bride and groom to be. But he also wanted to see some of the car. Had had me stand with lighting to brighten up the couples face. He wanted a nice glow cast on them. That same light was enough to light up the car as well. The rest of the image stayed dark. There were tools and clutter we didn't want to show. The couple was dressed for summer too! They went with simple white outfits. They actually went perfect in this garage scene. We never know what we are going to come across for photo opportunities. We love when we go to areas like Lewiston and walk around with the couple. We can stop anywhere on the way. Or come back to a location for better lighting later. We did that for this couple. We waited to use a few areas until it got dark out and all the lights would be on. 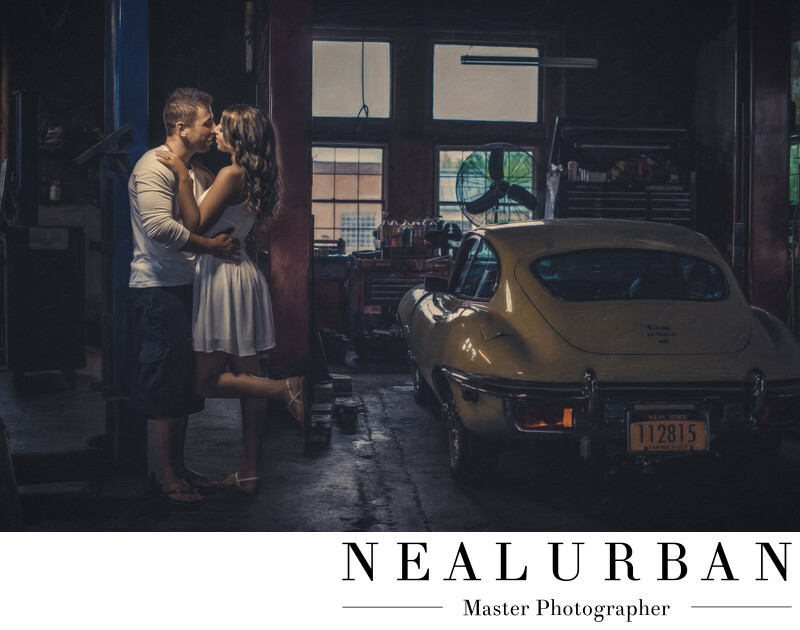 Neal Urban loves night photography! Kelsey and Jarred had their wedding ceremony at Salvatore's Garden Place Hotel. We did their photos (idle) at Delaware Park in Buffalo. The reception was down the road at Salvatore's Italian Gardens. Location: 550 Center St, Lewiston, NY 14092 .